The next thing I needed to try was check whether the network was fast enough to watch HD content on the Raspberry Pi, direct from the NAS. These are linked via 85Mbps Homeplugs, which should be fast enough, but I don’t seem to be getting anywhere even a decent ‘real world’ speed, never mind the theoretical maximum. At the ‘client’ end, the Homeplug is plugged in to one side of a dual socket, the other side being used for an extension that provides mains power to a router, the TV, HTPC, DVD player, PS2, Wii, Freesat tuner… that lot probably generates a fair bit of noise. I’ll rearrange the connections so the Homeplug is more isolated, when I can work up the enthusiasm. At first attempt, the video I tried to watch was stopping to buffer several times a minute; completely unwatchable. Then I realised that the old HTPC was still powered up, with a BitTorrent server running and who knows what else going on. Turning this off seemed to be enough to make the difference, bringing the occurrence of buffering down to about once every five or ten minutes. Not good enough for the all-important ‘spousal acceptance’, but I was willing to put up with it for one show. These problems should be solved after the weekend, as there’s a set of 500AV Homeplugs turning up, which should be more than capable of providing the necessary bandwidth. And I’ll have to rearrange a load of wiring anyway, when my broadband connection gets moved to BT Infinity, so it’ll be a good opportunity to optimise the network connection. Well, that was ridiculously easy. I’ve had DVD players that were more complicated to get working than that. 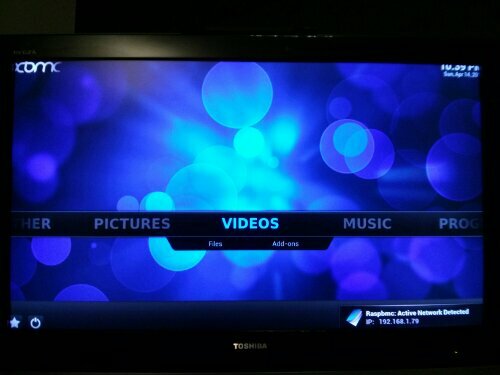 I followed the straightforward instructions at the Raspbmc website to put the installer on an SD card, plugged it all together, and… magic! 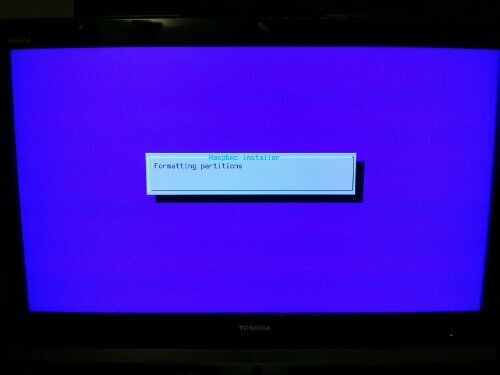 The Raspberry Pi powered up and warned me to grab a coffee while it downloaded things. Raspbmc started downloading the latest versions of everything it needed, rebooted a few times to install stuff, then sat at the main configuration screen waiting for me to choose a language. It’s a good job I didn’t need a coffee, I wouldn’t have had time to get one. Now, I’ve just got to work out how to control the thing. Took me longer to find a USB keyboard and mouse than everything else. I’ve already got it connecting to the NAS so I can play music and watch videos; photos don’t want to display for some reason, that needs further investigation. Next steps are to play about with the network settings to get it running fast enough to watch HD content direct from the NAS, and figure out how to use an infra-red remote control (although I’ve already got it working with the Official XMBC Remote app on my Android phone, which will do for now). Note to readers: if you normally read this blog for the things about travel to foreign parts, or stuff about cooking, you probably want to give this post a miss. Most of this is mainly intended to be a reminder of what I was trying to get working, rather than an entertaining read. You Have Been Warned. The media centre PC in the lounge has been providing fairly faithful service for something like eight years now, but it’s getting a bit long in the tooth. I think it’s on its third hard disk, and probably fourth cooling fan, but it just hasn’t got the processing power to cope with anything more than standard resolution video, and I’d really like to be able to play HD content. Also, I’ve recently got a NAS with some big fat hard disks, and it seemed to make sense to let this do all the work of downloading and storing content, and just have something in the lounge that would play the files without any other concerns. 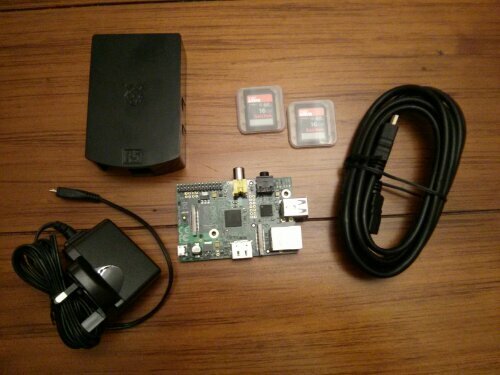 Also also… I wanted an excuse to play with a Raspberry Pi, and this seemed like a good reason, and potentially a cheap solution. If it works, I can buy another one to stick in the bedroom for those times when we each want to watch something different. SD cards (two: one for raspbmc, the other for “playing”). Doesn’t look like much, does it? You can get an idea of the scale from the charger and SD cards. I reckon you could just about fit one inside a packet of Cook’s Matches, which might make a nice ‘disguise’ for hiding one in a kitchen. In theory, the next step is to copy the desired operating system on to the SD cards, plug it all together, and it should mostly Just Work. In practice… well, I’m not holding my breath. … or, how Twitter’s changes broke my nice little perl script. The script for queuing tweets still works, but they all disappear into the void rather than getting tweeted, now that Twitter only allows external applications to connect using OAuth. I’ve found this handy little article here that seems to suggest that it’s easy enough to do using existing modules from CPAN.